Fabco Equipment Co., Inc Fabco Equipment specializes in providing custom conveyors and material handling equipment. Fabco handles everything from start to finish including research & development, custom engineering, millwright services, delivery, and installation. 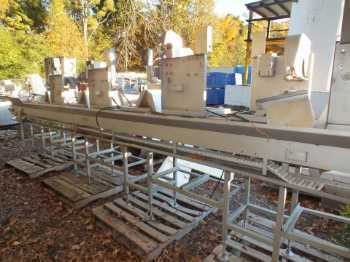 Used Fabco Sawing Conveyor Four Sawing Stations. Three Inch Conveyor Down Both Sides. Fabco Flattening Conveyor. 34 Inch Wide. 9 Feet Long. Used Fabco Sizing Conveyor. 1.5 Horsepower Motor. 60 to 1 Hollowbore Gearbox. 14 Inches Wide Belt. 40 Foot Long.